This is by far my favorite book about slate roofs. It's amusing, witty, and informative. It's loaded with color photographs. The book describes (in great detail!) various styles of slating, the tools you'll need, how to repair a slate roof, the types of slate that are available, the geology and chemistry of slate, and some interesting history of slate quarries in the US and abroad. It seems clear to me that Joseph Jenkins has been as important to the craft of slate roofing as Ted Benson has been to timber framing. The author and his family personally visited quarries all over the world in the process of compiling information for this book. If you own a slate roof or if you're just comtemplating a slate roof, you really need this book. Like the best books on timberframing, I have read this book several times and each time I discover something new. My copy is well worn and dog-eared. The book lives up to its lofty title. 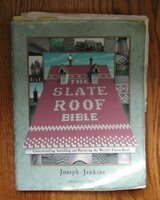 http://www.slateroofcentral.com The author of The Slate Roof Bible, Joseph Jenkins, maintains an active web site devoted to slate roofs. The discussion board is fairly active and his e-store has hard-to-find tools at reasonable prices. (I bought a slate hammer from him and one from ebay.) Also, somehow he is able to sell stainless steel nails cheaper than if you bought them directly from the supplier. (I bought 50 lbs from him). Title: The Slate Book: How to Design, Specify, Install, and Repair a Slate Roof. Authors: Brian Stearns, Alan Stearns, and John Meyer. 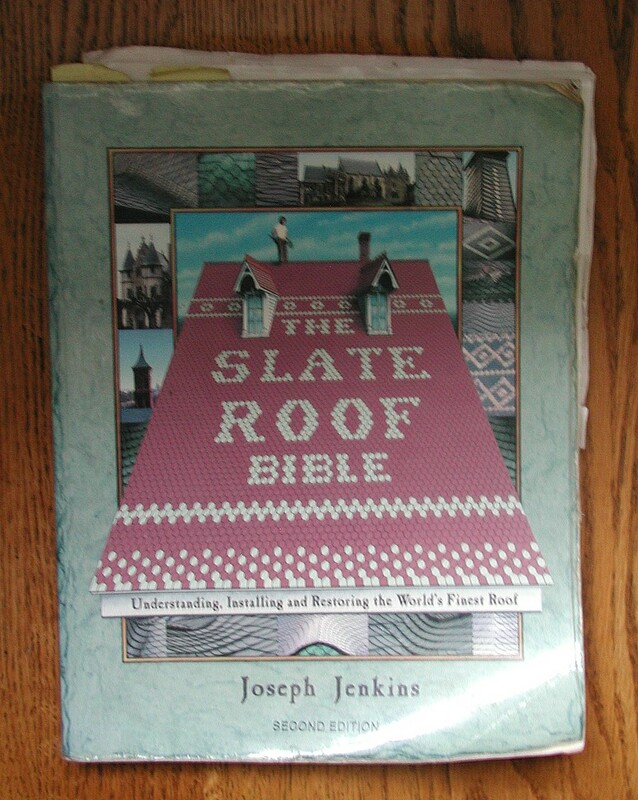 95% of what you need to know about slate roofs is in Joseph Jenkins' book - the other 5% is in this book. Whereas The Slate Roof Bible has hundreds of color photographs, this book has only a few black and white photographs of actual slate roofs. This book also has three authors... and it shows... when was the last time you read decent prose written by more than one author? But this book is not meant to be a work of art - it's a "manual," and somewhat useful. I'm glad that I bought it, as it fills in some of the blanks left in Jenkins' book, because it walks you step-by-step through each step of installing a slate roof. I found the comprehensive review of flashing methods and valleys to be extremely helpful. One of my complaints about this book is that I bought it to gain more insight on how to lay out eyebrow dormers, and here it falls woefully short. In fact, although the book has a "diagram" of layout lines for an eyebrow dormer, there's no photograph of a finished eyebrow dormer in this book. Any book that proposes to teach you something about eyebrow dormers darn-well ought to have at least one photograph of one! (Jenkin's book has two pages of color photos of eyebrow dormers.) If you're just a little interested in slate roofs or wondering what questions to ask, buy Jenkins' book, but if you're staring at 43,000 pounds of slate (like I was a few weeks ago) that need to be nailed to your roof, then you owe it to yourself to buy this book as a "second opinion" on slate roofs. turned out great. 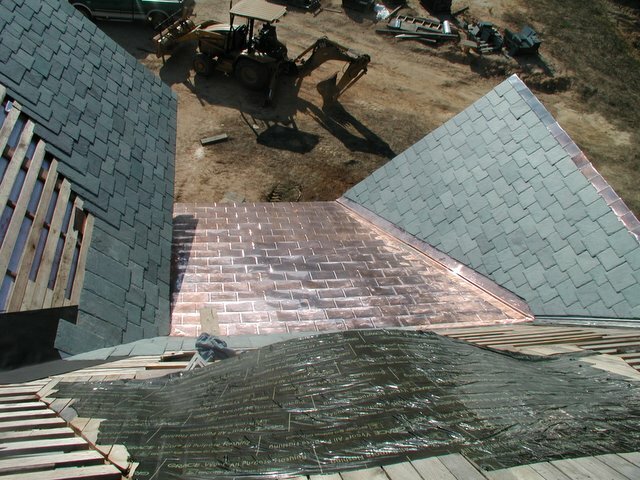 I guess the main advantage of copper shingles over standing seam copper is that a home owner without special tools (you'll need a hammer, metal shears and some wide pliers) can apply them. Standing seam copper might be more weather resistant, but these shingles look like they'll do a good job. 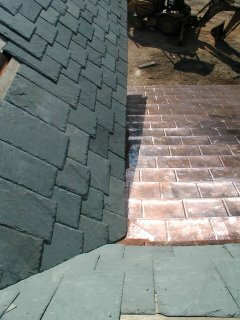 Before I chose these copper shingles, I ordered samples of them from Paradigm Shingles and from Zappone. These looked like a better shingle (sturdier and more weather resistant) to me. Here's an example of a closed valley with step flashing that we started on today. 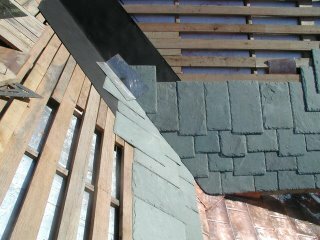 I've found two reasons to like stepped flashing better than continuous flashing - #1. when water goes beneath the slate and hits the step flashing, it will come back out on top of the slate in the next course. 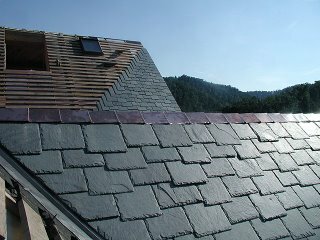 Whereas with continuous flashing, any water (and dirt and pollen) that goes under the slate remains under the slate until it reaches the end of the valley. 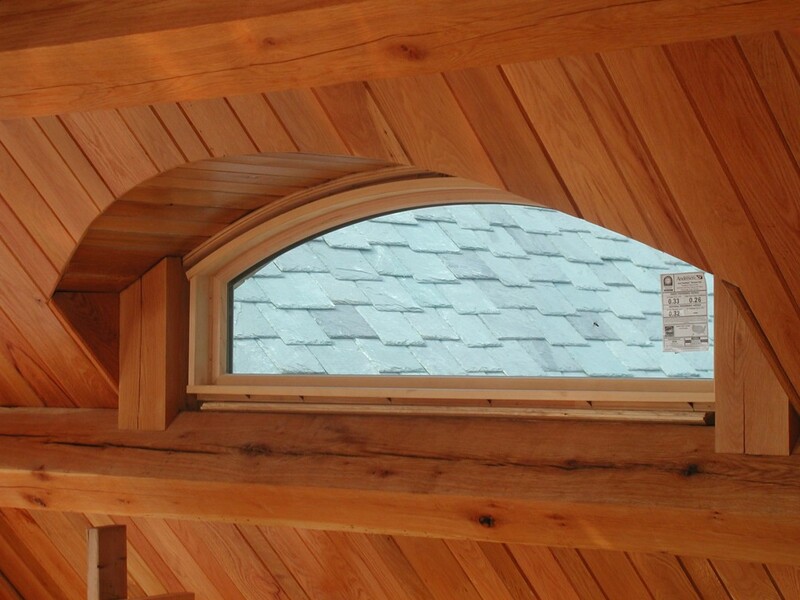 #2. when you install stepped flashing, you can nail right through the flashing when you install the slate above it. Better not try that with continuous flashing! In fact, you often have to punch holes in valley slates in order to avoid nailing through continuous flashing... making a tedious job even more tedious. Don't really have much to say about this last picture other than... why would you ever use fake slate, when the real stuff looks like this and is proven to last over 100 years? 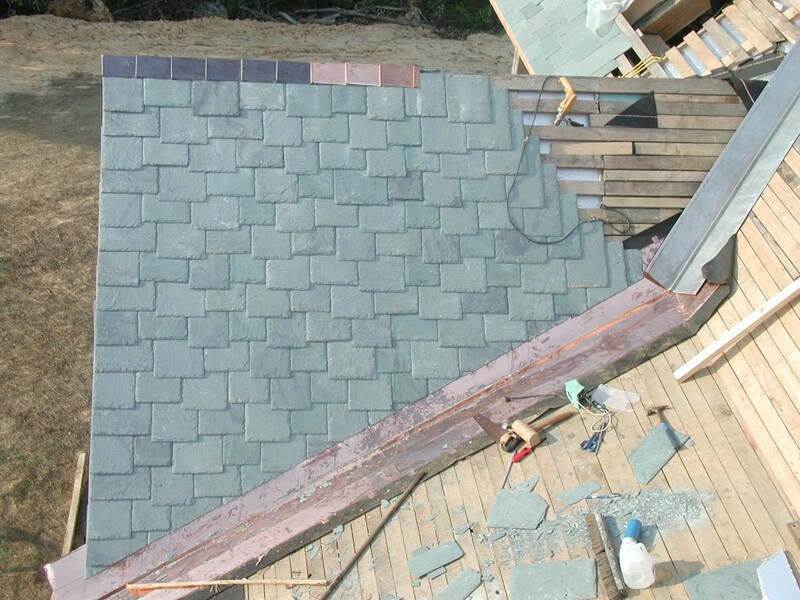 Contrary to what you might have heard, basic slate roofing is not hard to install. 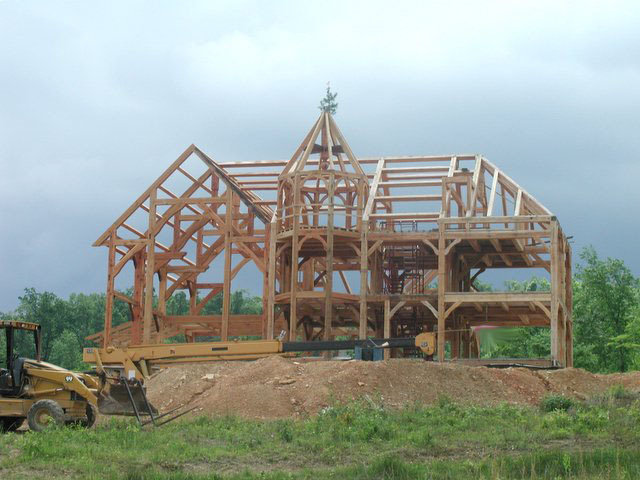 If you were slating a barn, with no gables or roof openings, the work would go fairly quickly. 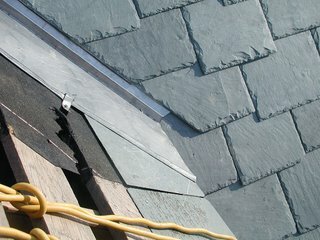 On the other hand, cutting and installing slate at the valleys is tedious work.. and the flashing is especially onerous. The first picture shows a piece of (continuous) stainless valley flashing that we made and wove into this slate valley. The roof to the right of the flashing intersects both the main roof (to the left of the flashing.. not yet slated) and the wall of the main house (not shown in this picture). If reading that was confusing, then you already know what I'm up against. There's also a hidden piece of stainless flashing, woven beneath the course of slates where the water from the flashing will shoot out of the flashing and on to the slate roof. I was afraid that the fast moving water could flow sideways under the slate and run through the nail holes in the slate, so I slid a piece of "bib" flashing between the courses of slate there. Stainless flashing will last longer and is cheaper than copper. But copper looks better and is easier to cut and bend. So, anywhere the flashing will be readily seen, I'm using copper flashing. In this (second) picture, you can see where I'm using copper valley flashing. Copper was a natural choice here, because the other side of the valley will have copper shingles. This second picture also shows the copper ridge cap that I've been using. (Note the first 6 pieces of ridge cap have been on the roof for over 6 weeks and have already lost their shiny penny look, but they match the slates even better now that they've weathered a bit). These copper ridge caps are wonderful if you are doing a slate roof and want easy ridges that will definitely shed water. The lip on the first copper ridge cap locks over the end of the gable slates. Then you nail the other end of this first copper ridge cap. (predrilling the slate is a good idea because the nails will have to go through the top row of slates). The lip on the second piece of copper ridge cap locks into a fold on the first piece of ridge cap and covers up the nails that hold the first piece of ridge cap. Nail the second ridge cap, and fasten the third ridge cap to the second, etc. etc. etc. I have two books on slate and neither describes this type of ridge cap, but I love it because there are no exposed nails. 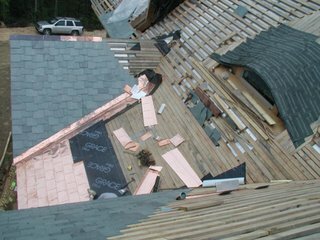 You can buy these ridge caps (as well as copper shingles) at Paradigm Shingles. 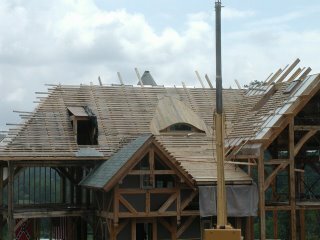 In the last picture, you can see where we've started to lay copper shingles. Fortunately I bought these last year, before copper prices jumped again. At that time, the shingles were about $500 per square, now they're over $700 per square (twice the price of slate). Like slate, these shingles go on quickly when you have no gables, eaves, or valleys to worry about. The devil is in those details. The shingle manufacturer makes things a little easier on you by providing valley, drip-edge, and rake pieces that the shingles lock into, but each shingle must be cut and bent in order to fit into these custom pieces, and this requires patience and time (but no specialized tools). For the most part, I've avoided using asphalt impregnated tar and "Ice and Water Shield" underlayments. Sticky tar paper is an added expense, it can be messy, it's another thing to help your house burn, it smells when it gets hot and off-gasses, and it probably won't last nearly as long as the copper and slate above it. With all that said, I've hedged my bets and decided to use it on the eyebrow dormer, and this fairly flat shed roof (the one with copper shingles). 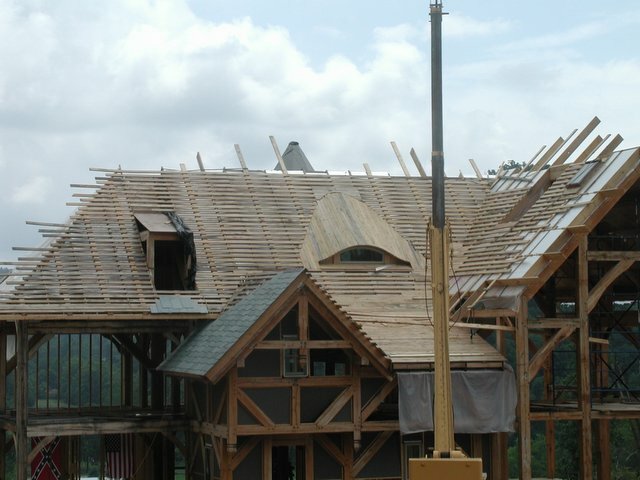 Just a quick picture to show how the eyebrow dormer is going so far... The trick (it seems) was to use 1/2" thick green boards instead of 1" thick dry boards. We had to twist and bend the boards to get them to lay correctly. It's going to be really fun laying slate on this surface! The shed roof below the eyebrow dormer is sheeted solid, because we're going to put down copper shingles there.